Let me get something out of the way straight up. I am a fan of Google. Are their services and products flawless? Probably not. Did they live up to their stated objective of “do no evil”? Well I guess the Chinese difficulties didn’t exactly paint them in the best light, nevertheless I can think of less savoury technology companies. On the plus side, I have used Google’s services and, in particular, their cloud-based e-mail – Gmail – for years and been very happy with them. If I explain that my smart phone is a Nexus One, you will probably get the general idea. However, Google have introduced a “feature” into Gmail which leads me to question what on earth they were thinking. This is the “Consider including” function. When you type an e-mail, Gmail comes up with a list of people that you may like to also copy it to. Let’s pause and just think about this. You are writing an e-mail, generally the first thing that you do is to type in the address of the person (or people) you are writing to. 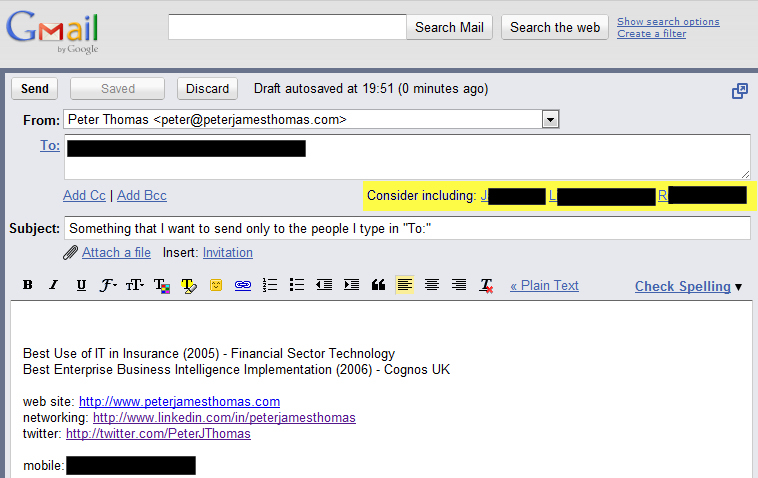 Gmail has a useful feature that scans your previous mails, so typing “Pe” will bring up “Peter Thomas” as an option. So far so good. But then, based solely on this first e-mail entered (not even on the subject), the bar highlighted in pale yellow appears above with a list of people that you may consider including on the mail. Google’s algorithms may be great at figuring out which context-based ads to display alongside the advertising-supported Gmail (though I must admit to never having clicked on any of these and to generally mentally filtering them out), but how does an algorithm know better than me who I want to send an e-mail to? I suppose we could give the geniuses at Google the benefit of the doubt, maybe they do know. Sadly empirical evidence is that the software doesn’t have a clue. In the example above, the contacts “J”, “L” and “R” (the names have been anonymised to protect those irrelevant to the context) have nothing whatsoever to do with the e-mail recipient (again anonymised) that I started writing. Aside from perhaps once being cc’ed in an e-mail sent to the person whose address I typed in, they have no relation to either the intended recipient, or indeed to each other. As to content, at this point there isn’t any, so it is anyone’s guess how Google generates the list; an even more worrying question is why do they? Not only does the feature fail to work, it is also totally asinine. It might make some sense for say Facebook to suggest people with whom you might want to share a link. However, there are people who you might e-mail twice a year for very specific purposes, that still get suggested in a “Consider including”. Google plainly doesn’t know better than me to whom I actually want to send an e-mail. A worry is that a stray click and a lack of attention could send an e-mail to someone who is not intended to see it. Given the fact that many small businesses and sole-trader consultants rely on Gmail, then – in extremis – this could lead to commercially sensitive (or indeed personally private) information being sent to the wrong person. The feature is clearly ill-advised and – worst of all – you cannot (at present) turn it off. This “feature” is bad enough to have merited me writing to Google asking them to remove it, or at least make it optional. Their support forums are full of people saying the same. It will be interesting to see whether or not they listen. I think you rightly capture the irrelevant nature of this Google feature when you note that “aside from perhaps once being cc’ed in an e-mail sent to the person whose address I typed in, they have no relation to either the intended recipient, or indeed to each other.” As Zoli Erdos also points out in his post, and prior to any content being written into the message, heaven knows whether the pending missive _should be_ intended for the suggested recipients. At most this is a silly feature that allows Google to highlight how their search algorithms is able to make suggestions based upon who you’ve previously sent messages when sending to those currently in the TO line. For all the reasons noted by both you and Zoli this is of limited, if any, use in the way it was implemented. Where Google missed the boat is in choosing the app within which to provide this feature. I believe Google could have served us well had they included this type of feature within the Contacts app, as part of the “create a group” or “edit group membership” actions. Within the context of Contacts it could be very helpful to see that 50% of the time when I send email to “Bob Smith” I also include “Jenny Jones”, “Frank Garcia” and “Susan Johnson” on the TO line. Right there is a Distribution List Suggestion Tool® in the making, and knowing that information when I’m in the app that targets efficiently managing my contacts would be quite powerful indeed. As it stands now the current feature is simply useless 99.9% of the time and managing Contact groups is still much harder than it should be. I agree that a functioning feature could work in another app and that this could include those that you state. However, I’m still not convinced that it is functional. Maybe my e-mailing patterns are weird, but it seems to be picking people at essentially random, or at least based on sporadic mails many months back. I have been a Google and Gmail cheerleader for some time. I loved their April Fools joke. This “feature” must have been invented the same day. I’ve just finished explaining to one of my clients that his sister probably didn’t hack into his email and copy herself on a personal note intended for his father. (Mind you, I’m not a family therapist. I’m a Resume Writer!) But he was nervous about my sending his documents because he’s worried his sister has hacked his account. Brother! This “feature” should go down in Google history as The Big Stupid. I trust you’ll do a follow-up to this post when they, at last, present an opt-out. Thanks for taking the time to post :-). Did you mean this April Fools? Will post a follow up for sure. hello,. If You recive that Consider including In your Box and when you will send email it coming , you JUST DELET the contact showing in (Consider including) after you can add that deleting contact as you want, and It will no`t com. Thanks saber – seems a bit long-winded compared to an opt-out box! I continue to be astounded that Google has not corrected this awful, idiot piece of technological stupidity. PS: Your CV is very well done! Does rather look like Google shooting itself in the foot doesn’t it? Excellent post. Thanks so much for writing to Google, it will mean a great deal to have this terrible feature taken off. My hatred for this feature has intensified so deeply that I have started to take it personally. The day they take off this feature, I will celebrate. literally (with champagne and Godiva chocolates). Seriously, what is Google’s problem? Does anybody remember the odd reminder alert ‘Call Dad’ on Father’s Day? It may be cute for some but my Dad passed away ten years ago, that alert made my heart cringe and yearn for my Dad. If Google keeps getting personal, I’ve had it. I am deleting my account. When I created my account, I had no idea Google wouldn’t respect my privacy. Maybe the people creating these features and alerts mean well and I’m sure they are very proud of themselves but they seem to be creating features bearing just few people in mind. If it has been designed for everyone, why not bear everyone in mind? My father is dead, so no I cannot call him. And no, I don’t want to include the plethora of inane ‘consider including’ suggestions. It’s like I have to keep saying ” thanks, but no thanks” or “please go away”. It’s annoying. Thank you for taking the time to comment and for your kind words. It will be interesting to see how much Google value feedback from their customers on the “consider including” issue. The “Call Dad” thing sounds horrendous – how much effort does it take to work out that this could be horribly insensitive? thanks for spending your time to save so many people you did a good job it irritating mee too. its a so stupid thing. Thanks for both reading and taking the time to comment. I got married recently, which involved sent lots of emails to everybody. Now it seems I will never again be able to send a private email to my husband without having to “consider including” my stepmother and my father. Highly inappropriate and psychologically jarring to see that every time I send an email. I really wish I could get rid of this “feature”. I really don’t see the point of it. For some reason (best known to Google) I constantly get “consider including” medical practitioners, who I have mailed maybe twice in the last couple of years – clearly I want to copy them on my arrangements to go to the cinema with my partner! Peter: Totally agree: I hate this pointless feature, which has caused me embarrassment by enabling accidental sending of personal stuff not intended for that person. This is so obviously a possibility that it beggars belief that such a foolish ‘feature’ could’ve been added. I’ve complained to G, like many, and will have to ditch gmail unless they remove/make optional this thing. Thanks for taking the time to comment Marcus. I was rather hoping that it would disappear in the latest Gmail upgrade – it appears not, but maybe there is an option as I haven’t trailed through all the features as yet. I’ve just read all the posts on Google’s Help Forum about “consider including” from June till December 2011. All hate it and want it gone. So it seems Google is not interested even though there’s not one comment supporting the feature. So what is it for? It doesn’t even work remotely well, so it can’t be for kudos. A few posts say if you’re using Google Chrome as your browser, you can turn off this and other features with Florian Besier’s add-on GMELIUS. I use Firefox and I don’t want to switch to Google’s browser so I’m not trying this solution but some people here might be able to. See Help forum > Gmail > Composing and Sending Messages > How to switch off the ‘Consider including…’ feature??? I use Chrome, but don’t really want to have to use an add-in to disable a Gmail “feature”. It does seem like a prima facie case of a company feeling that it can totally ignore the collective wishes of its customers. I guess they feel that we are a captive audience. Very foolish and short-sighted of Google IMO. You shouldn’t have to use an add-on to disable a Gmail feature, but it seems that they really don’t plan to remove “consider including.” Gmelius was ridiculously easy. Click a button, tick some boxes, done. Thanks for taking the time to comment Christine. Some thoughts on Google’s general approach to Social Media (including webmail) from The Atlantic here. Sadly everyone hating it doesn’t seem to hold much sway with Google – they are probably too busy diluting their shareholders’ say in the company to worry about issues like customer complaints.